I had a bright idea today to make a light bulb and hold it over my head every time I have a bright idea! So here is the pattern that I came up with. It’s fairly easy, fast and fun to crochet! Sew on eyes and face as desired. Need help? No worries just leave a comment! 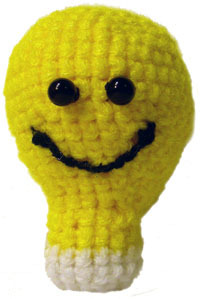 This entry was posted on Friday, March 13th, 2009 at 8:34 PM by Rachel Choi	and is filed under Free Crochet Patterns. You can follow any responses to this entry through the RSS 2.0 feed. You can leave a response, or trackback from your own site. Rachel, you are so gracious. Your patterns are adorable and I look forward to your newsletter. Thank you for your website, for sharing what you’ve learned. Hope it continues for a long time! Crochet Spot will be up and I’ll be sharing patterns for a very long time! I can’t want to get more things on here. Hi, Rachel! Just popped in to see what you’re up to. More great patterns have been added since my last visit. You work fast, Rachel! Thanks for all of the great patterns and tutorials! Thanks again for popping in! Thank you for a fab pattern, I now have to make 16 of them to help inspire my writing group at school lol. Perfect for the job!! This is so cute! You have the most adorable things on this site, Rachel!